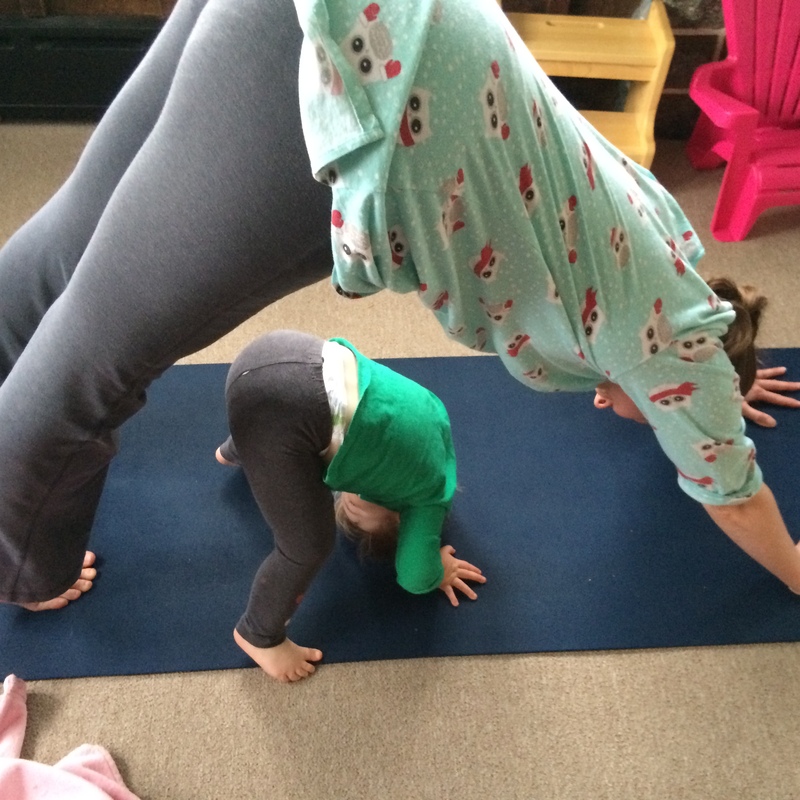 Something that happens more and more often lately is the YB (who hasn’t turned two quite yet, so can still be called “Yoga Baby”) will pull out the mats and ask to do yoga. For a long time her favorite part of the process was simply rolling out the mats – and always mats, plural, because she insists on having one of her own instead of just practicing on mine – but now she’s starting to actually do poses with me. I don’t have any training in children’s yoga beyond a 15-minute presentation one of my YTT buddies gave a few years ago, and it is hard to figure out what asanas to show her! 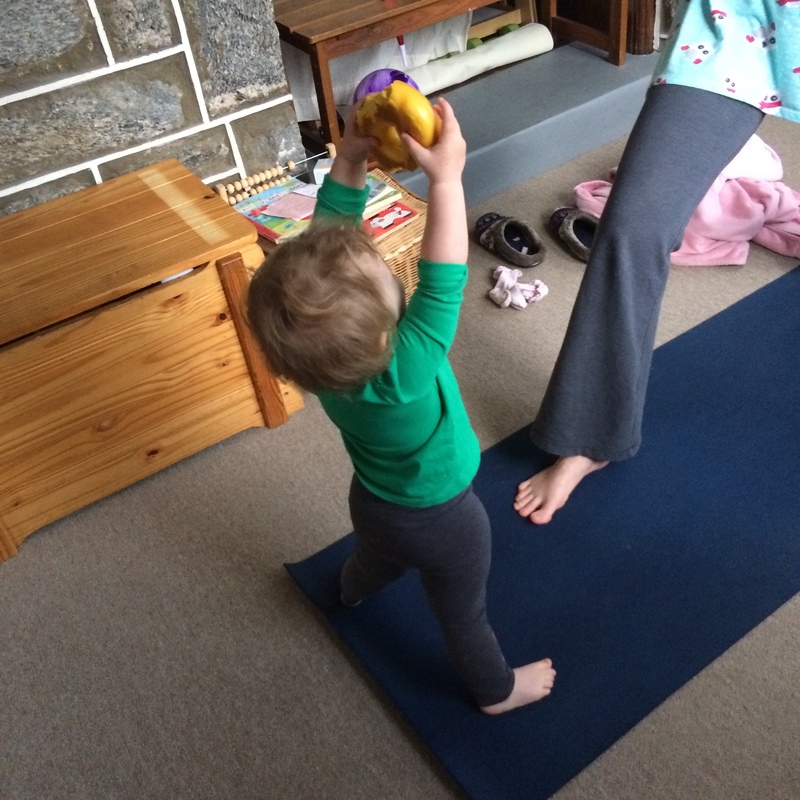 Her favorite is downward dog, of course, because she can do it super-easily (with her head on the floor, but still). But you have to do more than just down dog all day. At first I was doing half sun salutes, because she liked how I would peek at her during the up and down and it mostly kept her attention (at left is YB doing a bagel salute last month). Lately, though, she’s been wanting more. We’ve also experimented with some partner poses. She loves climbing on my back when I’m in child’s pose (or any pose where I’m low to the ground, really). She also LOVES yoga flying. We’re nowhere near the point of being able to do anything like this, but maybe in a few years! 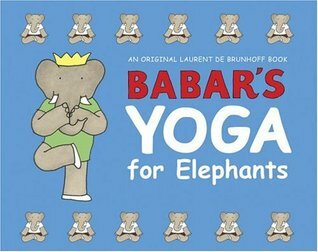 One thing that has helped more than I expected is Babar’s Yoga for Elephants, which I didn’t think we’d use till she was older. This is the only Babar book we have, a gift that a friend from my old job spotted at a yard sale and scooped up for me. The level of the text is still a little beyond YB for me to read to her, but she loves looking at the pictures of the elephants doing yoga. We flip through it together looking for poses we can do. I still have some more continuing education to do to keep my Yoga Alliance registration current. At this point it would be more than I could handle to try and do some sort of children’s yoga training, but I am looking at different books to read, and I’m considering downloading a webinar or two from Yoga U Online. (I’ve downloaded some of their free ones, and listened to an interview with a children’s yoga teacher so far, but I’m not yet ready to pay them money for their content just yet). I figure if I need to clock some hours anyway, I might as well do it on activities that will help me share yoga with her. And overall I’m just really enjoying practicing yoga with my little girl.